Collaboration among different scientific branches are within the program's visit. Dr. Peter Agre, president of the American Association for the Advancement of Science, a Nobel laureate in chemistry, and director of the Johns Hopkins Malaria Research Institute, is among the members of a nongovernmental U.S. delegation that traveled to Cuba for discussions on science policy from November 10-13. A press release from the AAAS says the group is to meet with leading Cuban scientists and policy officials. The visit is meant to explore research issues and science venues that might lead to scientific cooperation between the two countries. 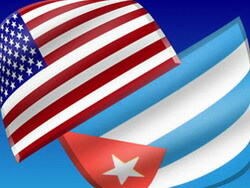 The delegation plans to visit the Academy of Sciences of Cuba and the University of Havana. It also anticipates meetings with officials of the Cuban Ministry of Science, Technology and the Environment; the Ministry of Higher Education; the Ministry of Public Health; and the Ministry of Foreign Relations. -Lawrence Wilkerson, professor of government at the College of William and Mary and chief of staff to Secretary of State Colin Powell (2002-2005). Cuba has oustanding results on Biotechnology and Medicine among others and its policy towards the environment has been praised more than once by different international bodies.